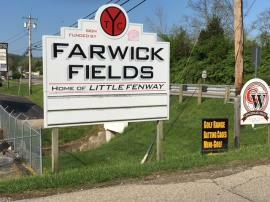 In March 2018, the Hamilton County Health Department (HCHD) requested assistance from US EPA to conduct a Site Investigation at the Farwick Fields Lead Site in Miamitown, Ohio. The Site is currently utilized as a youth baseball field during the spring and summer. For the last 15 years, the Site has been the location of a fund raising turkey shoot (shotgun shooting) during November-February. In February 2018, the adjacent Great Miami River flooded Field 5 with 3 feet of flood water. In March 2018, a citizen filed a Nuisance Complaint Report with HCHD after visible lead shot was observed on the bare soil field during spring maintenance to prepare the field for spring youth baseball. Field 5 is currently closed. CHICAGO (May 8, 2018) – This week, U.S. Environmental Protection Agency will conduct soil sampling at the Taylor Creek Youth Organization property located at 8015 Furlong Drive, in Whitewater Township, Cincinnati. Earlier this year, Hamilton County Health Department sampled baseball and softball fields after receiving a citizen complaint that the fields were being used for turkey shoots, potentially leaving behind lead from the projectiles. U.S. EPA will sample the fields this week and determine the next steps after the sample results are reviewed. The agency will coordinate with Hamilton County Health Department on any recommendations for use of the fields. A US EPA removal action is planed for Summer 2019.